8 of the Best Auto Shows in America! For more than 100 years, the automobile has been an inextricable part of the American lifestyle. And while the younger set might be more invested in their smartphone than their ride, cars remain an essential and fascinating component of our daily lives. Consequently, cities around the U.S. continue to hold auto shows every year, showcasing the best of luxury, technology, and innovation. We've collected "in no particular order" eight of the best. It's no surprise that the Motor City is home to this massive showcase of automotive innovation and excellence. Detroit looms large in the history of American automotive history, and visitors to the North American International Auto Show can look forward to nine days of cars, tech, and entertainment. The show boasts hundreds of makes and models, concept cars, and innovations in automotive design and function. The show also has special luxury, charity, and press events-those with the credentials or the cash can take part in special previews of luxury vehicles, enjoy premium entertainment, and cast their bids in silent auctions. Under the Hood: "An automotive event unlike any other." Ticket prices vary. The public show promises "muscle and electric cars, high-performance supercars and full-size trucks" as well as "the opportunity to see up-close the vehicles and technologies that will shape the future automotive landscape." You'll need to be a member of the media or the automotive industry to attend this trade-only show, held annually in Las Vegas. Billed as "the premier automotive specialty products trade event in the world," The Specialty Equipment Marketing Association (SEMA) show is focused on new products, customization, and education. Attendees can view thousands of new and updated automotive products, attend educational seminars and product demonstrations and network with other industry professionals. Under the Hood: More than 140,000 industry professionals come together to explore the latest and greatest in automotive, truck, SUV, and RV markets. Dozens of educational opportunities via detailed seminars and product demos. Founded in 1900, the New York International Auto Show is cruising into its second century as one of the country's leading auto shows. More than 1,000 cars and trucks will be displayed across four floors of automotive goodness, and visitors can expect to test drive new cars, try out the latest upgrades, tweaks, and features, and get a sneak peek at the future with a variety of concept cars. Under the Hood: Ticket prices vary. More than 1,000 vehicles, including concept cars and experimental tech. Visitors can also buy tickets to the annual gala, meet celebrities, and take part in special demonstrations and events. The country's largest consumer auto show takes up more than one million square feet in Chicago's McCormick Place each year, and trust us-it needs the room. Packing in more than 1,000 vehicles (including concept and experimental vehicles), countless product demonstrations, celebrity meet-n-greets, special charity and visitor events, and plenty of food and entertainment, this show's a must-visit for serious car enthusiasts. Under the Hood: Ticket prices vary. Special events include Women's Day, Family Day, and Hispanic Heritage Day. This show is enormous, and has something for just about everyone. Take a trip back in time at this classic car show and charity concours (a parade of classic cars). You won't find the latest tech or next-gen smart cars at this charity event, but you will find some of the most unusual and beautiful cars ever produced. And while the Elegance may be held in Hershey, PA-home of the famous Hershey's Chocolate-the sweetest part of the Elegance weekend lies in the races, the gorgeous galas and auctions, and, of course, the Concours d'Elegance itself, where pristine classics form a line of timeless automotive splendor. (There's still plenty of time to enjoy the local attractions, however, and swing by Hershey Park for a souvenir or two). Under the Hood: Ticket prices vary. The weekend is focused (as the name implies) on the upscale and elegant, including a garden party, gala, and auction. Car-loving foodies won't want to miss the on-site "lifestyle demonstrations" and tastings provided by the Hotel Hershey. As you might expect from a show set in Los Angeles, the LA Auto Show puts a premium on glitz, glamor, the shiny, and the new. Combining a trade show with press and public displays, this show (which made its debut in 1907) is more than just a showcase for new and concept cars; it's also a must-see for "hundreds of thousands of qualified car shoppers and auto fans, in the nation's biggest car buying market for ten exciting days." Under the Hood: Ticket prices vary. Set in media-savvy Los Angeles, the show receives heavy coverage, worldwide, from more than 4,000 media outlets, and also draws in more than 18,000 industry experts for its trade and media component. Special events include the Connected Car Expo (CCE), a "one-day conference and expo held in conjunction with the Los Angeles Auto Show Press and Trade Days (that) brings together the entire eco-system driving the convergence of technology and the automobile." For consumers, the show offers not only a chance to peruse the latest and greatest automotive wonders, but also a chance to test drive cars, meet celebrities, and win prizes. Racing fans will love visiting this show, held at the famous Charlotte Speedway in Charlotte, North Carolina. Held twice a year, the AutoFair styles itself "the world's largest automotive extravaganza," and combines elements of classic car shows, trade shows, and a giant automotive flea market. 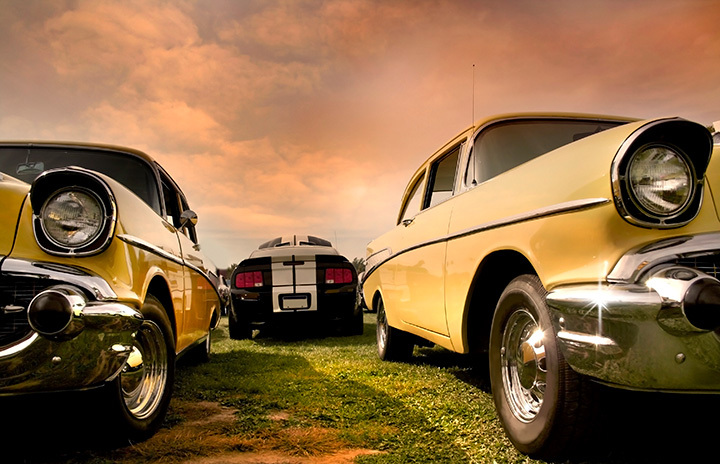 Visitors can check out highly customized collectible and classic cars (or show off their own) and track down hard-to-find parts, accessories, and vehicles. Under the Hood: Admission to the flea market is free; the venue itself charges for parking. Visitors can expect to see a lot of tricked-out, custom rides, classic and collectible cars, and, if their fancy and budget allow, even purchase cars at the classic car auction. Detroit's other big car show is indeed a classic and collectible lovers' dream. It's known as "the world's largest one-day celebration of car culture," and with good reason: the Dream Cruise attracts more than one million visitors in a single day, all of whom arrive eager to see the more than 50,000 "muscle cars, street rods, custom, collector and special interest vehicles" on display. In addition to plenty of crusing classic cars, attendees can enjoy sharing a picnic with friends and family and shop for Dream Cruise Merch. Under the Hood: Admission is free, although those driving non-classic cars are asked to keep to designated lanes during the cruise. This is a truly massive event that draws visitors (with their cars) from around the globe, so expect to see collectibles and classics you might not find anywhere else.